Insulation companies everywhere can breathe a sigh of relief once they start using Ensign's easy-to-use Insulation Estimating Software, designed specifically to meet the needs of modern insulation contractors, and to get your estimating done quickly, accurately and without wasting any time costing materials and labour. Leave the competition in the dust and get your estimate in to your client while they’re still totting up what they need for the job. 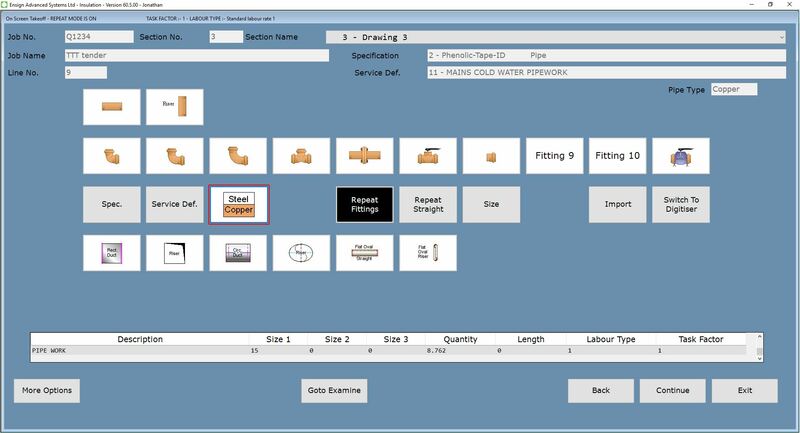 Whether you are manufacturing your ductwork or buying it in, the clean, intuitive interface and layout of our estimating software will increase your productivity and cut down estimating time significantly; leaving you free to get on with the job in hand. Adding profit and prelims is simple to do and you’ll find it a breeze to prepare bills, such as full quantified schedules of rates. Browse our comprehensive reports to give you a true picture of each job, from profits to costs, with each report available as an export to Excel, CSV, Word, PDF, and more. Scroll through reports to help you choose cheaper materials with the same high quality you need, explore labour costs and breakdowns to help you control time spent on site and associated costs; all to help you analyse your work, save money and increase profits. You won’t have to waste any time setting up the databases because Ensign will set up your estimating software for you, including materials and labour times, giving you a bespoke and company-branded experience that focuses on the exact needs of your company, and leaving you to concentrate on your job from day one and enjoy your increased profits. Ensign’s highly advanced Ductwork Estimating Software will quickly and accurately allow for bought in costs (like dampers, spiral tube and fittings, etc), shop labour time and costs and manufacturing materials. It will also calculate site time and costs for you, and even make allowances for site difficulty. Ensign are the only serious supplier in the UK of this easy-to-use, time-saving software and offer tailored one-to-one training for your staff, helping you get up and running quickly and easily, and start reaping the benefits straight away. We offer amazing support from a highly knowledgeable and friendly team, who you can rely on to be on hand to answer any questions you may have, and we constantly develop the software around the needs of the people who use it, giving you the most highly advanced software (we’re now on version 60! ), specifically designed for you and your company, with regular and comprehensive software updates so you always have the right figures, on time, every time. Call Ensign now and speak to one of our friendly staff to find out how your company can get started!